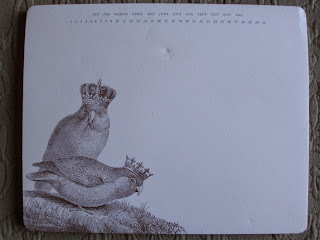 1) Golden Pigeon - There are now four pigeons perched above my bookcase, three metal and one wood. This newest one has just a hint of gold to it. 2) Flag Socks - I kind of love seeing the American flag around, so if I at all like any of the products made with its design, I do like to get them. The only disappointing thing was that I hadn't realized that one of these socks has the stars and the other has the stripes: I would have preferred each one to have both. 3) Frog Notebook - My latest addition to my notebook collection is this one with the dapper frog on the front; he reminds me of Mr. Toad from The Wind in the Willows. 4) Pie Town Soap Co. Victorian Charm Soap - I haven't put any soaps on these lists in a while. 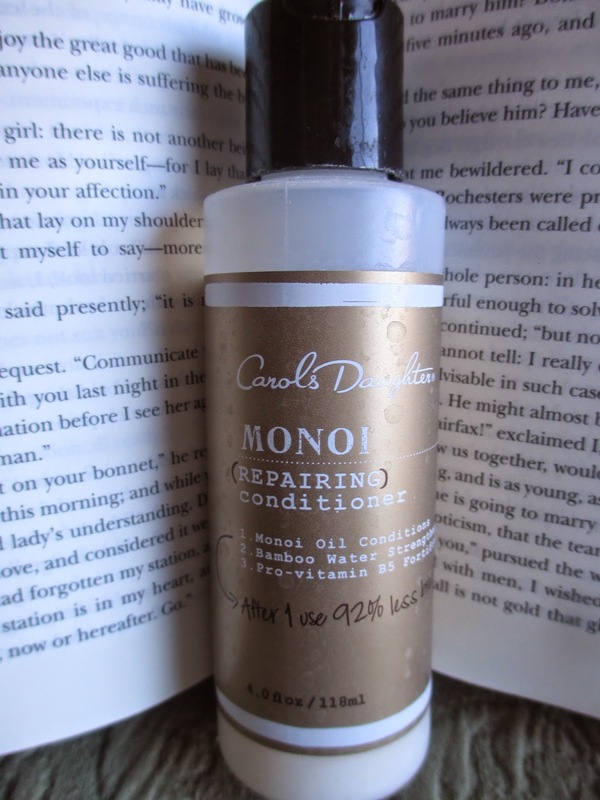 The last scent I used was Victorian Charm, which has vanilla, rose, and cedar. The vanilla and rose give it a pretty and feminine aroma while the cedar gives it a woodsy and more masculine edge. 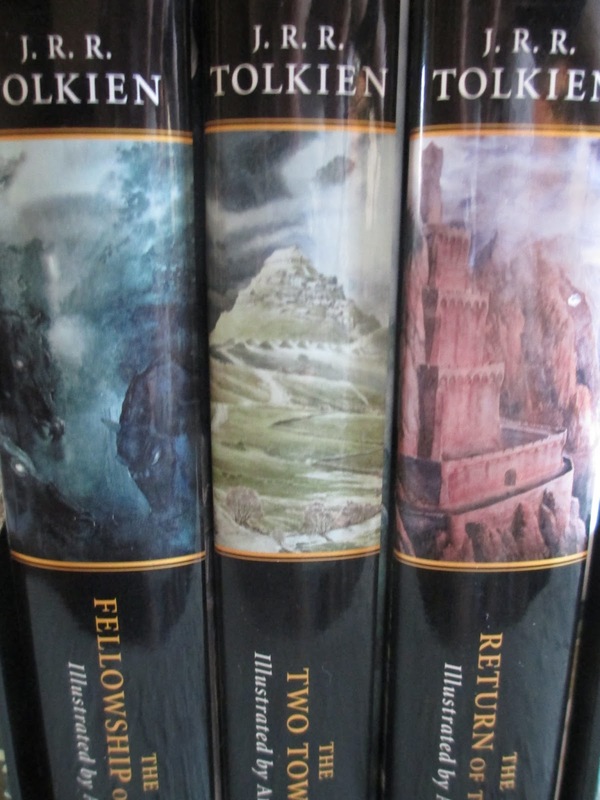 5) Illustrated The Lord of the Rings Set - I happened upon this set in an antique store and since I have the illustrated Silmarillion, well, I had to get these, too. It was about time. Oh, how nice it is to finally have these in my possession so that I can go over the pictures in person and at leisure. 6) Betsey Johnson Alligator Necklace - I'd been wanting some Betsey Johnson jewelry for a while now, but was having trouble deciding on the right item. You see, I'm already the kind of person who tends to look often as much as seven years younger than I am (nice when you're in your forties but slightly awkward when you're in your twenties), so wearing a big cat or fairy necklace wouldn't exactly help to establish that I'm not in my teens. So this reptile was just right for me: the alligator itself is fairly big but not too blingy (as far as Betsey Johnson is concerned) and the chain is plain. And I do love reptiles and green as accents to my outfits. 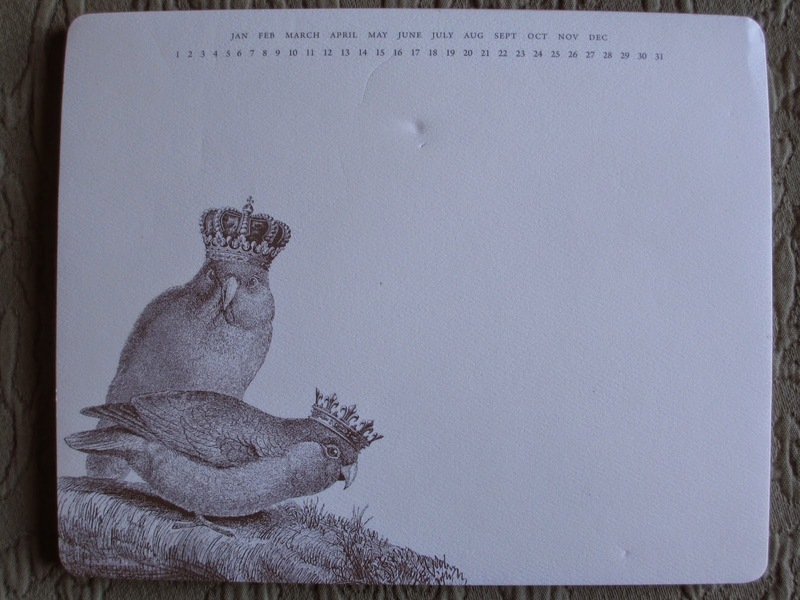 7) Bird Notepad - These birds aren't pigeons, but they were close enough that, well, I couldn't resist. I'm sort of pretending that they are pigeons. And I'm also trying to convince myself that it's okay to write on this notepad. 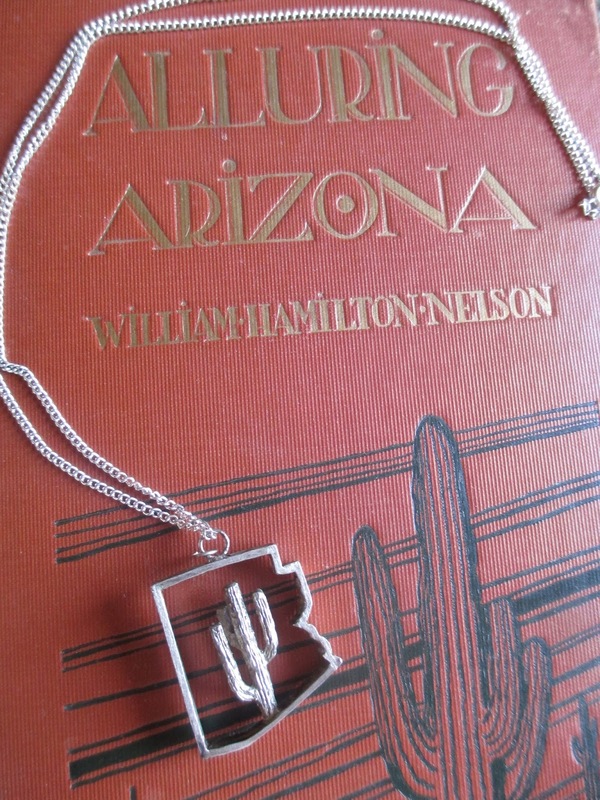 8) Arizona Necklace - Just as I love seeing the American flag, I also love Arizona products. So a necklace in the shape of the state with a saguaro in the middle was just the thing for me. It's from an antique store, so I've no idea where it originally came from. 9) Wives and Daughters - I watched Cranford a year or two ago, so now it was time for Wives and Daughters. This is a good story and made for a nice four-part miniseries to watch over a couple of days. Definitely refreshing if you're tired of watching five hundred movies based on Great Expectations, Oliver Twist, and Pride and Prejudice. I haven't actually gotten around to reading Wives and Daughters yet (I've read Elizabeth Gaskell's Cranford and Ruth, though) since it's rather long, but perhaps later this year I'll finally break into it (I do own a copy already). 10) Chi Pro Low EMF Hairdryer - One more random item. I think we all know by now that microwaves are bad for you--I don't use them. But what I hadn't realized was that hairdryers are also pretty bad (I thought it was only the noise that was harmful). My friend was telling me about how Low EMF hairdryers are better, so I nabbed one from CHI when they were on sale at Ulta. Though my inexpensive Conair hairdryer was very reliable and trustworthy, it's quite interesting to now have my first pricier hairdryer. It's quite quiet and yet still has power to it and seems to dry my hair just as well. Despite the fact that its inclusion of spaceships and different types of people from different planets makes Star Wars sci-fi, I think of it more as fantasy. The Force is akin to magic, the lightsaber duels are akin to sword fights, and what's the difference between aliens and fantastical creatures anyway? Oh, yes, and there's even the awakening of a character from sleep like death. Not Prince Philip waking Sleeping Beauty, no, in Star Wars it is the princess who does the waking. Han Solo isn't quite in an enchanted sleep and he isn't under a curse, but the chief villain has put him into a sleep from which he cannot wake on his own. Darth Vader has allowed Boba Fett to deliver Han Solo to Jabba the Hutt; he is consequently well-guarded in his deep sleep. So he might as well be in an enchanted sleep. Enter Leia in a carefully-organized plan of rescue. Her role: to wake Han. Not to get him out--just to wake him. That is enough. True, it is the pressing of buttons on the panel that ends the hibernation, not her kiss, but that's a mere technicality. The image of her waking him remains. The princess waking her love from his death sleep. Other than the simple image, there are a couple of other things to note about this waking. It proves that just because one character, at some point, needs the other one to wake him/her, that does not mean that he/she is weak. Do you know what I mean? Sometimes princess stories get hate because people say they portray women as needing to be saved by men. Maybe that's true--but that isn't the only way to interpret these stories. Especially Sleeping Beauty. That's a movie about two people who meet and fall in love and then encounter some dangers, after which the prince happens to be the one who is awake and therefore able to help the princess. It's like that with Star Wars: no one would call Han Solo a weak character (in that sense of the word--he is sometimes weak, towards the beginning, with his self-centeredness and his love of money), yet at this point in the story he needs saving from Leia. The second thing is the reversal of roles and the fact that it is not isolated to this one scene. In contrast to the idea of princesses who need saving from men, Leia often helps Han, as he often helps her. When they first meet, for instance, she is the one who takes the gun and opens up a way for them to get into the garbage disposal area to escape from the detention section. Leia is never one to be passive; after all, she is one of the leading figures of the rebellion and no passive person would even be part of the rebellion, much less help lead it. So we return to the image: the man who has been put under a deep sleep from which only his love, the princess, can wake him. Has everyone else been having such weird weather? Usually by the end of May, the heat starts to get an edge to it--summer starts to settle in and it gets uncomfortable to be outdoors during the day. But the weather is still nice enough right now to have the door open even in the afternoon--and a couple days ago it was cold and it was raining and are you sure it's almost June? So I need reminders that it's late spring, nearly summer. Limeade in the refrigerator, cantaloupe for breakfast, and afternoons spent sitting outside reading. Oh, yes, and how about some mango chocolate? I know, I'm not sure if that sounds good or not, either. 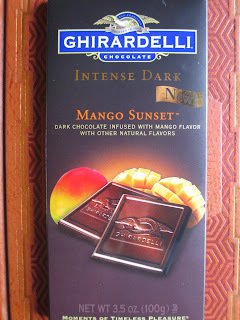 It's a new flavor from Ghirardelli, Mango Sunset. And it's hard to know what to think of it. You see, I like Ghirardelli, as long as they don't veer away from what they're capable of doing, and what they're capable of doing is making simple chocolate bars, either plain or with very classic flavors (mint, caramel, etc.). Sometimes when they try to get creative, they just show what they're not capable of. And mango chocolate, well, that's not exactly traditional, is it? Hence my worry. Tearing the seal on the foil wrapper reveals the smell of mango and chocolate together, not exactly something I found exciting. I usually eat mangos plain. And maybe mangos are close to citrus--and I generally don't like citrus chocolate. But what worried me more than the idea of the flavor combination was when I had my first taste and wondered if there was something artificial in there. All the ingredients list says is "natural flavors." 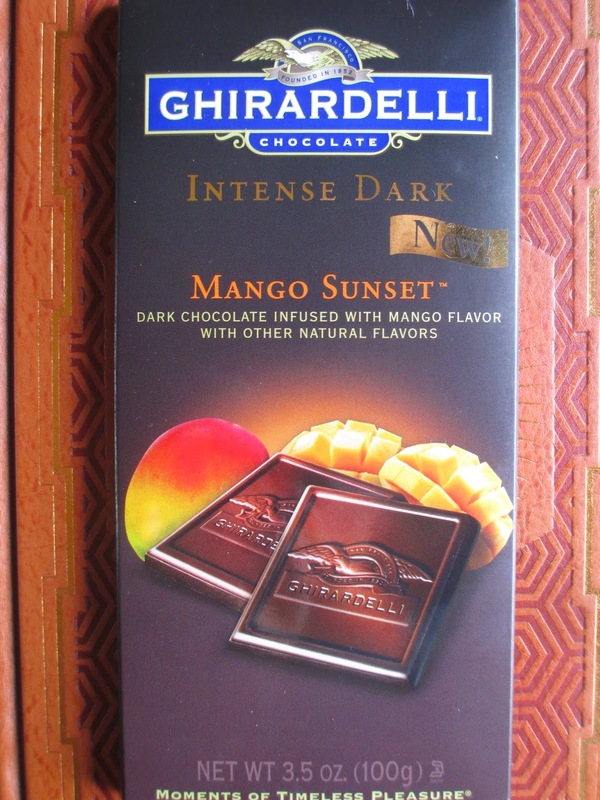 And even the flavor description calls it "dark chocolate infused with mango flavor with other natural flavors." Huh. It would seem that mango isn't an easy flavor to get into chocolate without using lots of real mango, perhaps in pieces. But what are those other flavors? There's no mention of what they are--so they must not be included for their own sake; they must be there to try and enhance the mango flavor and its unity with the chocolate. But I just keep getting this weird flavor. Is it the mango, unexpected in the middle of chocolate? I don't think that's it: the more I taste, the more I grow accepting of the idea of mango chocolate. It's freshness and brightness, orange and yellow, to stand against the deeper red of the chocolate; it works. It's just that other, unidentifiable flavor that tastes strange (I realize that this flavor may in fact be the mango, and if that's the case I would like to see a better representation of mango in chocolate). The chocolate itself is a light dark chocolate. I don't think it's a 75%; it's probably more like a 65% cocoa. Probably a good thing that it isn't too dark: this lighter persona better suits the mango. So was I right to worry? Yes, probably right to worry. But was I correct in my worry? I'm still not sure. I think this chocolate comes across okay: I'll finish it. It's an interesting idea for a summer chocolate. But I suppose I won't buy it again; I'd rather have one of Ghirardelli's plain Twilight or Midnight bars. You decide if that's a failure or not. Ooohhh, I didn't know what I was missing out on. Did you know? 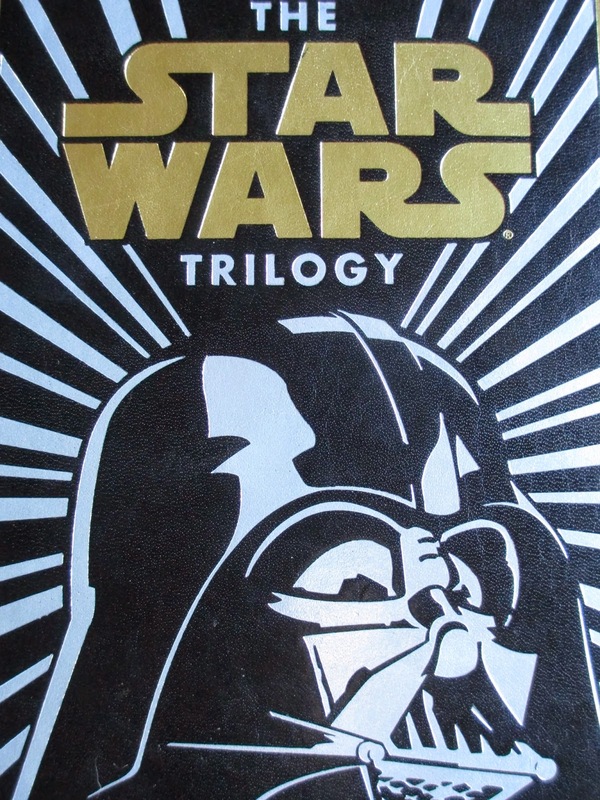 Did you know all the feels that are contained within the novelization of Return of the Jedi? I'd thought--I don't know. I mean, I enjoyed reading The Empire Strikes Back, but this was something different. This was, this was all the power of the film that's created so many Star Wars fans, all put into 230 pages. I can see why Barnes & Noble did one of their leather-bound editions of this trilogy--and not just for the cool cover. Star Wars is simply such a great story, built on so many archetypes and symbols and universal themes that it rises up to be something incredibly moving. And not only does this book portray what was in Return of the Jedi the film, it amplifies it. There are a few scenes not in the movie and a little extra dialogue that let you take a longer look at character development, as with The Empire Strikes Back. But there was also more symbolic power in this book. There is more emphasis on what the settings mean. You fully get a sense of what it means for Luke to return to Tatooine, and if you'd never pondered the meaning of Endor before you'll get it now. It isn't coincidental or random that it's Ewoks who help overthrow the Empire. And, oh, that scene when Leia is waking up on the Endor moon after she's knocked off of her speeder, it's just gorgeous. The imagery and the themes encapsulated in that one moment are flawless: that's what's wonderful about Star Wars. You can get battle scenes or sci-fi/fantasy settings anywhere, but it's the themes that make it special. And the confrontation between Luke and Darth Vader, wow, it loses nothing from being translated from a visual medium to a flat page. I'm so sad for Anakin, the path he took when his life could have been so different--but then he does come through in the end and it isn't too late for him, but it is too late for his life. It's terrible, terribly tragic, and beautifully tragic. I didn't know this book would move me so. I'm incredibly glad I've begun this journey into Star Wars books. Next up: a break and then the prequel trilogy. So, Josh Groban's latest album, Stages, has been out for a couple of weeks now and I'm pretty sure I've already listened to it more than the previous album, All That Echoes. Ah, Josh, I've been listening to you for so long that you feel like family (there is a bit of a facial resemblance, too), but I am so glad you've veered back toward a more classical sound again. I'm not implying that I want to have direct control over an artist's angle or that I think it's wrong if they change that angle: that's their choice, apart from my opinion about what I prefer from them. But I really wasn't a big fan of All That Echoes and Illuminations. That closer to pop angle just wasn't interesting me, and I felt (with my non-musical ear) as though many of those songs didn't show Josh's voice as well as the songs on Closer did (which, granted, not every album a singer releases needs to push them to their heights--if they're releasing lots of albums, then they can also provide something different). But Stages is like a reminder, if anyone needs a reminder, that Josh has a great voice. There's technical achievement and emotional expression. As I'm sure you know, all of these songs are from musicals. I feel very uncultured to say that I'm only familiar with eight of the fifteen songs on the Deluxe edition. "Pure Imagination" and "All I Ask of You" are kind of exciting to have on there. "Bring Him Home" is amazingly beautiful and heartbreaking; it's a stellar performance and I'd probably call it the best track on the album. The "Children Will Listen/Not While I'm Around" medley worked well, in terms of both sound and theme. Never having heard them before, I'm getting intrigued by "Old Devil Moon" and "Finishing the Hat." On "If I Loved You," Audra McDonald gives beautiful, rich vocals. In the context of the album, "Empty Chairs At Empty Tables" becomes a commentary on the temporary state of all people--the listeners will fade, the singers will fade, the connection they had will fade; everything, no matter how big it gets, will end one day. This, too, will end--so hurry, go and get the album so you can listen to it now. 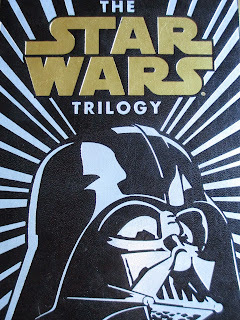 Wow, has it really been over three months since I finished reading the first Star Wars novelization (read my thoughts about it here), so excited at opening the door to so many new books in this universe? And then I got sidetracked. I stopped to read Divergent, then I was reading some Arizona books, and then there were a couple of things going on that kept me busy. And so only now, three months later, have I finished reading The Empire Strikes Back. I'm just like Luke, feeling so strong and powerful and then being pushed right back to the beginning again. While I spoke of how it took some effort to get into the first book, The Empire Strikes Back had better writing quality and less often assumed that its readers knew nothing about this universe (which, of course, would have been the case in 1976 when the first book came out--but is certainly no longer the case today even for people who have somehow not watched the movies). So that was less distracting, and I was able to really get into the plot and characterization. I was reliving seeing these movies for the first few times (since I really don't remember the very first time I saw them); it was like everything was new. Everything was exciting, the battles and the escapes in space, Luke's encounter with Yoda and the Falcon group's arrival at Cloud City. And everything was beautiful again. The descriptions gave just enough to make me see the scenes in the movies, to once again find myself in the ice of Hoth or outside Yoda's cute little hut (I hope Yoda wouldn't be offended by my calling it cute--but, no, he isn't the offended sort), to revel in the pink beauty of the clouds around Bespin. While after watching the movies several times and several times again you get to know what the characters' motives and thoughts are at different points, still it was nice to see some of it spelled out on the page. The book is technically third person omniscient; most of the time, it's just a narrator telling the events, but often there is a sentence or so saying what a certain character is thinking. I think the droids actually get the longest sections to their own (describing their thoughts, I mean); I suppose that makes sense given their (semi-hidden) important to both the story and the movies. I was planning on reading something else (right now I have a long stack of things that I really want to read right away) first before starting on Return of the Jedi, but, ah, I think I may have to just move right into that one. Just as I was held back for a moment there, now I'm ready to finish it--like Luke finally taking those final steps. I adore the Mission Inn in Riverside. And given its situation on the edge of LA and its surrounding bulk of outlying cities, it makes a perfect stop on the drive home from California back to Arizona. Stop at the hotel for a night, or for a browse through the Mission Galleria antique store across the street, or to get a box of Casey's Cupcakes to bring home (a bag of them is also an acceptable carry-on for the plane). This box of six had two Cinnamon (the ones on the top left and right corners), two Peanut Butter (on the bottom corners), and their flavor of the month: Crownie. They also had a Mother's Day flavor, something with almond frosting and a layer of raspberry; it was very pretty, but not my flavor preferences. The Crownie has a Ghirardelli brownie on the bottom, plain cake for the rest, and a sprinkle of delicate, shiny glitter on the top of the frosting. That isn't the official description, but I wasn't thinking of reviewing it when I was in the shop, so I didn't make note of exactly how the saleswoman described it. Yeah, I know, you can buy Ghirardelli brownie mix at Costco (I don't know if Casey's uses a mix, or buys the brownies from Ghirardelli already made, or makes them themselves with Ghirardelli ingredients), but it's brownie in a cupcake and it's very pretty. 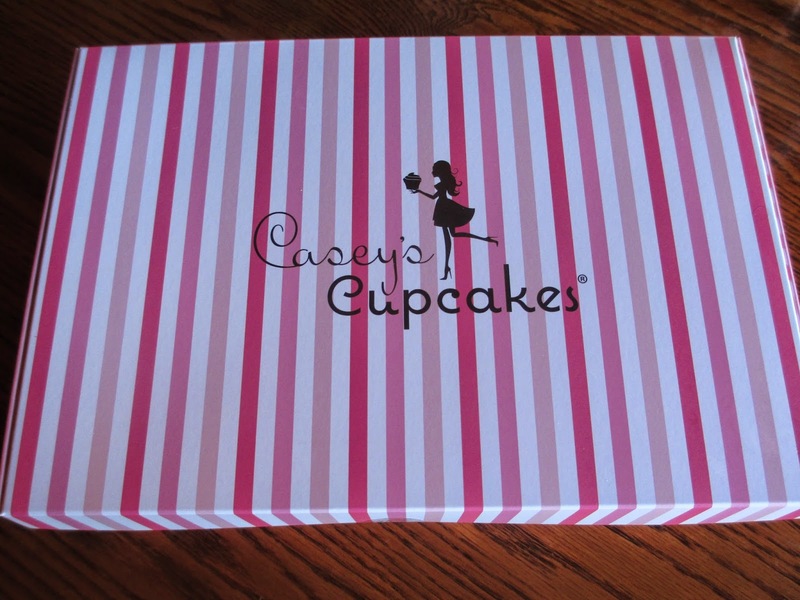 I've reviews Casey's cupcakes before, so I won't go into general details, just about the specifics of this flavor. The brownie makes up just the right proportion of the cupcake. It's maybe about a third of the depth, right there at the bottom, so it doesn't take away from the light cake texture that brownies need. It just adds a little more richness. And look at that glitter. So pretty and tasteful, not overdone. I think it may be a milk chocolate type of frosting with its light brown shade. Sweet enough and not too buttery (I can make buttery frosting at home--I don't need to go anywhere to buy it). 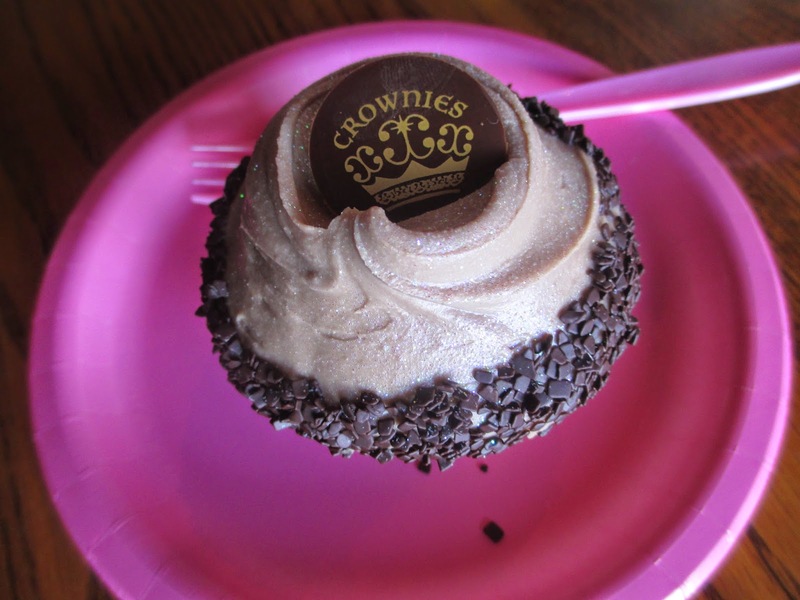 Instead of the usual chocolate with the pink Casey's silhouette, the Crownie has its own chocolate circle with a golden crown. Though some of the cupcakes have something different from the chocolates (like the peanut butter cup for the Peanut Butter cupcakes) on top, I think that's the first time I've seen the chocolate circles with a different image. By the way, I also highly recommend the Cinnamon cupcakes. Along with Strawberry, they may be one of my favorite flavors. 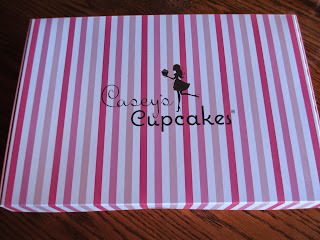 Ah, I love this tradition of cupcakes to bring home. Though it officially came out today, I've had the digital version of Fireflight's new album, Innova, for a week now and I received my signed CD on Friday--as part of the pre-orders. So I've had a chance to listen to it a few times already. While some albums can take a moment to get used to and to understand the tone of so that you come to like them more with time, I think I've understood Innova right from the start. From the album title, you already know that it's supposed to be about renewal--and that's exactly how the songs are. They're a slightly different sound from Fireflight's previous music, a little more of that upbeat, danceable pop sound that's been going around lately and a little less on the heavier rock sound. And not only is it a sound that's been popular lately, but it also makes sense: they're songs about not having any baggage and being fueled by the positive light. "Resuscitate" and "We Are Alive" were the first two singles from the album and they pretty much stand as emblems for all of it. I would particularly like "We Are Alive" to be a sort of anthem for this genre of music: it expresses exactly what the Christian life should not forget. There is light, there is life, and there is passion. Sure, there are moments of difficulty, but there should never be passivity or a lack of passion. Never forget that you are alive. I also really like "Safety," which features Stephen Christian; I didn't realize he was the singer of Anberlin and of Anchor & Braille--I may have to look into his music because I really liked his voice in this song. The song's also more along the lines of Fireflight's earlier days (with a modern sense to it, though, I think); maybe that's why I like it. I'm not going to go song by song and I really have nothing more to say about the sound (since I'm not a music person and don't really have the vocabulary to describe it). I'll just say that I'm enjoying this new album and you should all go buy it if you haven't already. There was a time when I thought that I wanted to study history in college. And then I came to realize that my interest in history is in terms of the culture, way of life, and thoughts of people who have lived--which is primarily the focus of the study of literature. So that's how I came to choose literature instead of history. Now that I've settled into the pace of being out of college (where you are made to read a great many books), I've started my scattered excitement over reading a variety of things that I choose and that I alone really want to read. I've started in on Star Wars and I've also been picking up a lot of Arizona books. And what interests me most in the latter field are the accounts (preferably firsthand) of people who have lived in this wonderful state. 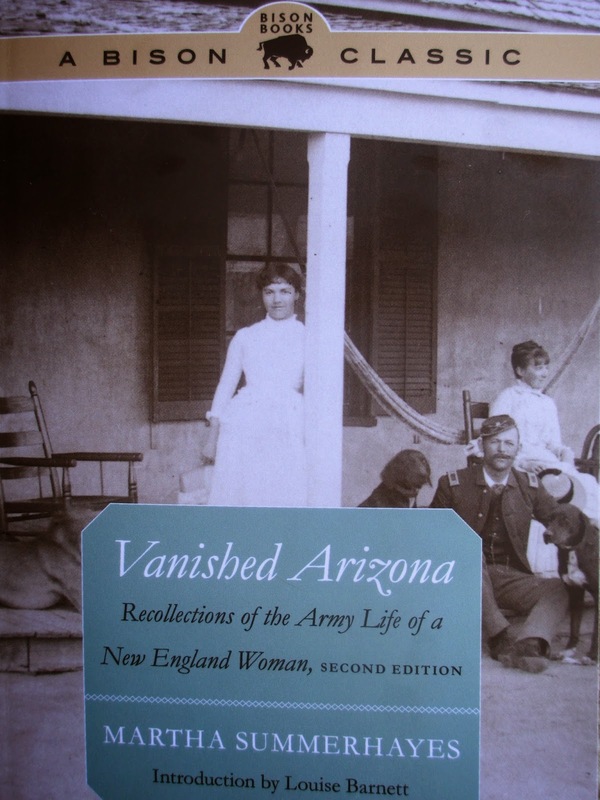 When I was at the Sharlot Hall Museum in Prescott last month (they have a pretty wide selection of books there, by the way), I was excited to find Vanished Arizona by Martha Summerhayes, which had kind of been on my list of books I should read for a while. Martha Summerhayes was an army wife; her memoir was published in 1908 and covers her married life from 1874 on. From a station in Wyoming, her husband was soon sent to Arizona, where the two of them lived at a few different places over the years. There is also some account of their time in California, Nevada, New Mexico, and Texas, but mostly this book is about Arizona--in the 1870's. And it is such a good book. Martha gives such an honest account of her life, what she saw, and what she felt. She includes her own folly, too, often saying (especially towards the beginning) how she wasn't used to certain ways of doing things or was very ignorant about things that would have helped her. She doesn't exactly describe the family she came from, but it seems they were upper class. Coming from that, she becomes the wife of a second lieutenant (the higher the rank, the better the quarters and things like that--and second lieutenant wasn't quite the highest rank) in territories far from what she had known as civilization. So she talks about the intense heat, the cold, the lack of fresh food, the loss of luggage and personal items, the difficulty of travel over rough and barely trodden roads, and often just the loneliness of living so far from friends and family. It's a good picture of what life was like for the families that accompanied the officers into the frontier. Despite all of the troubles, Martha mentions from time to time how this place that was so difficult to live in was taking a certain hold on her and how she was glad that she had gone with her husband instead of staying behind and letting him go it alone. And yet she also will bounce back from saying comments like this to moments where she did wish she had never come, giving descriptions of the complete horrendous nature of living in these places. (Of course, she uses her own language to say all this.) And that's one of the things that I found so real about her account. Sometimes you don't just love a place or hate a place: sometimes there is so much more to your relationship with a land or a place and with your life, too. There are so many stories in here, about food, about travels, about the people she meets, about the customs that everyone had at the various posts. Some are funny, some are sad, some are quite frightening. If ever anyone had adventure, it was these people. Everything that happened to them was . . . big. And that's the note that she ends on. This book is called Vanished Arizona because she emphasizes how much Arizona changed even ten years later. I think a lot of the historical places around here, when they talk about "how things were" tend to focus on the 1880's--and so much was different just in the decade before that. She mentions how the new ways didn't seem to suit the place and that she preferred it the way that it had been--even though, as you're reading, you know that the changes make it such an easier place to live in without all of the troubles that she had to go through before. And it makes me think about what it is to love a place like Arizona from a modern perspective--I have to give this more thought. Final statement: read this book if you have even the slightest interest in any of it. It's wonderful.